View cart “Red and Gold Ornament Holiday Gift Tags” has been added to your cart. 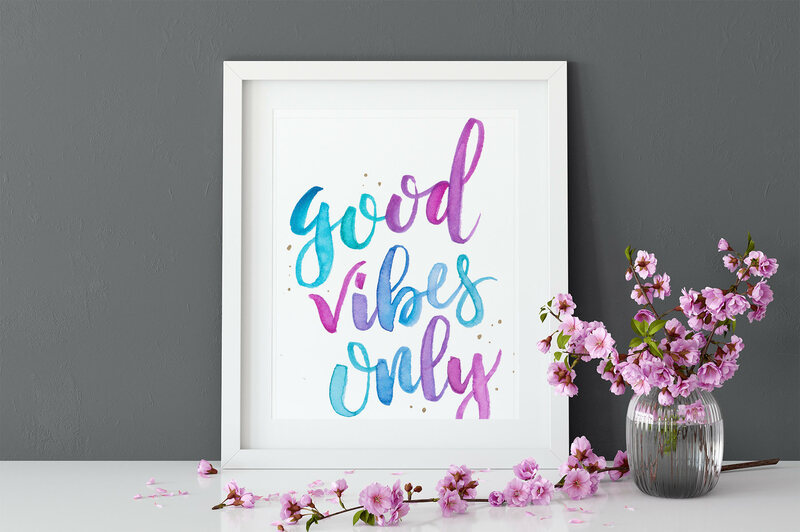 A gorgeous hand lettered wall art print featuring the inspirational quote “good vibes only” written in watercolor brush script. These prints are available in 5×7″, 8×10″, or 11×14″ sizes. My prints are Giclee prints on museum-quality 350gsm fine art paper, which has a similar texture to watercolor paper. This paper contains no optical brighteners, and is printed use pigment inks to ensure a long-lasting print. To store your art print, I recommend a sealed frame with glass, mounting in an acid-free book, or storing in an acid-free storage box. Ships in a sealed acid-free clear bag. Multiple prints are separated by acid-free tissue. Ships in a rigid mailer.